Above the crop floats a BoL. For the moment it hangs there perfectly still. 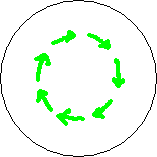 No force from the BoL´s circlecurrent acts on the electric charges of the ions in the stalks. 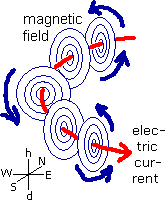 As long as the circlecurrent doesn’t change, its accompanying magnetic field doesn’t change either. A magnetic field that doesn’t change and doesn’t move exerts no force on electrical charges that are standing still, like the ions in the stalk (Lorentz force law). So for the moment nothing happens. We take for analysis a horizontal plane just a small distance under the circlecurrent, see the dotted line in the small vertical cross-section picture. The BoL, and with it our plane of analysis, is viewed from above and you move along with the BoL’s velocity. You see the BoL standing still beneath you and the soil of the earth receding behind the BoL. Since velocity is relative, you are free to choose this point of view as your standing-still base. Doing so provides a neat frame of reference in which the law of the Lorentz force can be applied correctly, see fig. 3.2. For reasons of simplicity, we assume the ions in the stalks of the crop to have a positive electric charge. If they had a negative charge all forces (light blue arrows) would point in the opposite direction. 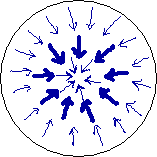 The inward bound dark blue arrows depict the magnetic field (horizontal component only). 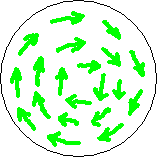 The ring of fat arrows means the field is strong there (just below the circlecurrent), thin arrows give weaker field. 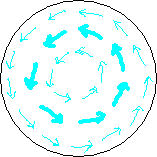 The swirling light blue arrows depict the forcefield, that is the force exerted by the BoL’s magnetic field on the moving charges (the ions) in the crop. 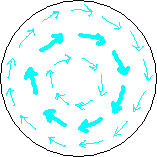 The ring of fat light blue arrows (strong force there) lays on the same place as the ring of fat dark blue arrows (strong field). Mind, field is not the same as force. Green arrows point in the lay-direction of the crop. As depicted in fig. 1.1, when the force on the ions is in one direction the lay of the crop is in the opposite direction. 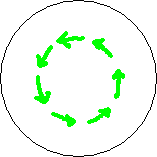 If the weaker part of the field cannot reach the necessary ion concentration in the stalks, only a ring appears, at the location of the fat arrows. The small diagram depicts the BoL’s circlecurrent (red) as viewed from aside and its current plane of analysis (dotted line). It also shows the velocity (grey) of the ground (brown) - the whole earth in fact - with respect to the BoL, which in fact is the velocity of the stalk’s ions in the magnetic field of the BoL. If the BoL had moved downward towards the crop, instead of upward, and went through it until it hits the ground and disappears, Lorentz law then gives the picture of fig. 3.3. 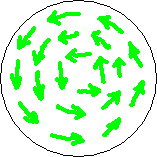 The magnetic field remained the same but the forcefield has reversed direction, and so the lay of the crop. On this page so far I had in mind the asymmetric grow-pulse as means of downing. What about the downing-by-radiation version, the downing by steam-expansion at one side of the stalk? It works more or less the same; by means of growth or by means of steam-expansion, both ways have asymmetric enlarging of the stalk at the location of the ion concentration (however not necessary the same ions). What worries is the threshold: there is no reason why below a certain threshold an ion suddenly would absorb no radiation no more. Therefore there isn’t a well-defined threshold. But look at the fields. The strength of the magnetic field causing the ion concentration, drops with the distance, causing lesser ions concentrated when further away from the BoL. Radiation intensity, when one single BoL is the source, drops with the distance too, causing lesser radiation absorbed by any ion when further away from the BoL. As an effect the over-all heating may drop that quickly at a certain distance that it sufficiently serves as a threshold. 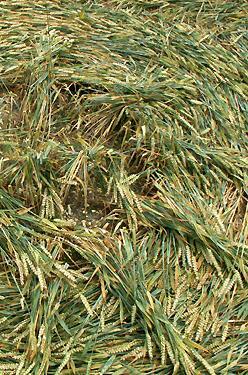 A threshold is needed to get those beautiful sharp edges seen at most cropcircles. Only calculation or simulation can tell. Or maybe experiment. Page 7 is about experiments. Well, except from experiment to show it actually works, there is a small back-fire, a certain set-back effect. Follow me to the next page!